Did you ever wish you could have a digital marketing cheat-sheet? Well, you may be in luck, Google Think has arrived! Pulled out of beta this March, Google Think has become my favorite treasure trove of insightful information, playbooks, presentations, case studies, and research, brilliantly organized with an architecture and design quality that’s perfect for afternoons of curious thinking and strategy. Refreshingly clean of ads, with simple calls to action, it’s a website that makes the serious marketer focus on their game. I did a post on Google+ for real estate a while ago, and mentioned that one of the things that makes Google+ so exciting is the infrastructure that Google is building around its tools. It’s building a learning environment that is connected through people. Tapping into the powerhouse of it’s toolbox, of YouTube, Google Drive, reading, viewing, saving, sharing, and storing information blends seamlessly into the user experience. Below is a little breakdown of it’s main organizational menu. As content marketing makes a comeback, and RSS feeds disappear, Google Think moves into the space to help organize marketing information by the user’s objectives. By providing information in easily digestible areas, the user is gently pulled deeper into the site to get to the meatier content. Perfect. Need to drive sales? Build brand awareness? Dig deep into your objective to craft your strategy. Confused about different types of marketing like video? Mobile? Social? Ad Types is there to help you get inspired to find ways to innovate in those areas. For example, its category of mobile marketing is full of case studies, infographics, consumer trends, and more, and serves you a full course meal of resources. Sometimes you just need to know what works for others. Get perspective. Exactly what “Perspectives” sets out to do. Articles, columns, interviews, and contributors, are located here providing insights into different industries and verticals. Otherwise known as “The Infrastructure”. Familiar digital maketing tools with Google stylishly placed on the website to help you understand what they offer. From search, ads, Google analytics, YouTube, and Google for Business, find what you need to execute on your strategies. A showcase of marketing campaigns that blend creative genius with digital innovation. See cool stuff. Learn how it was done. All brands struggle to innovate and capture consumer mindshare. The Sandbox takes real brand campaigns, breaks them down, and shows the finished result. It encourages thinking, growth, and even wants to to share your own campaigns. I think this is amazing first step into utilizing crowd-sourcing to scale new ideas into your business. Go ahead and play. I added a few finds I have found recently that are great pieces of information, packaged in a way that is digestible. Pay attention to the organization of the information and how it’s presented to you. 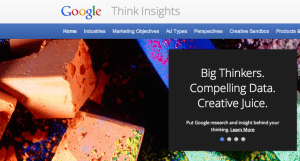 Lessons learned from Google Think are great models for digital marketing and content done well from a user’s mindset. It’s an experience I will come back to. If you are serious about being a digital marketer, this a great tool box.